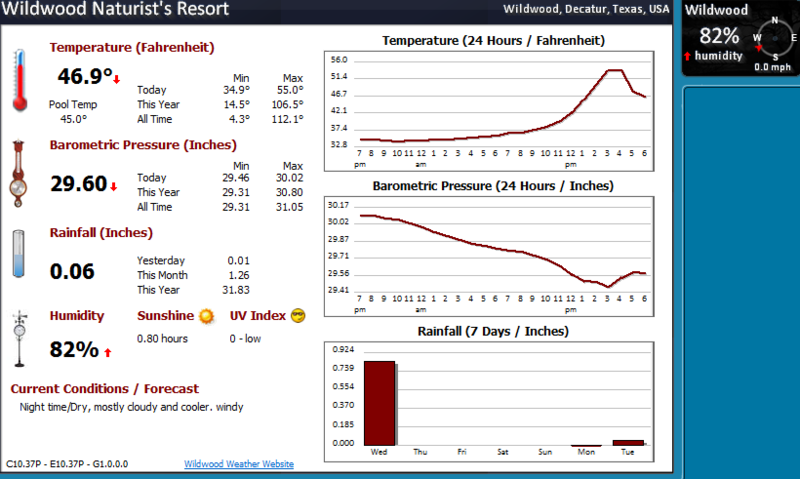 The Wildwood Weather Gadget is a desktop gadget for Vista or Windows 7 (or XP with additional software) that provides Wildwood Weather information on your computer desktop. Clicking on the gadget will display a flyout page like the one below with additional information. If you want even more weather information, you can click on the link at the bottom of the flyout and the Wildwood Weather Website will be displayed in your browser. The gadget will cycle thru up to four weather conditions (Temperature, Humidity, Barometric Pressure, Rainfall). 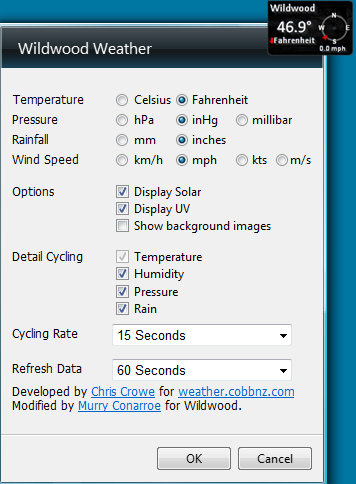 The conditions, cycle rate, and refresh rate are user configurable settings as shown below. Version 1.2 - Update for those using larger than normal fonts. Version 1.1 - Added temperature rate change.